The hearts of sports car aficionados with an eye for beauty and a thirst for luxury and innovative technology will beat a little faster with the arrival of the new BMW 6-Series Coupe. The third generation of the top-class Coupe sees premium carmaker BMW adding another intoxicating chapter to its decades-long tradition in the production of exclusive dream cars. The new BMW 6-Series Coupe impresses with its irresistible design and inspires with even sharper driving dynamics than its predecessor, noticeably optimised comfort levels and extra space. This is the only car in the segment to offer the combination of top-class sporting ability, exclusive touring comfort and a 460-litre (16.24 cu. ft) luggage space. Also on board to deliver the BMW 6-Series Coupe's signature driving experience are a range of innovative driver assistance systems and BMW ConnectedDrive infotainment features. Its unmistakable design language gives the new BMW 6-Series Coupe an aura of athletic elegance. The sweeping bonnet, short front overhang and set-back passenger compartment team up with a 74-millimetre increase in body length (4,894 mm) over its predecessor and a 75-millimetre longer wheelbase (2,855 mm) to create the hallmark proportions of a BMW Coupe. BMW TwinPower Turbo technology with petrol direct injection provides both sporty power development and exceptional efficiency in the engines available for the new BMW 6-Series Coupe from launch. In the new BMW 650i Coupe, a V8 powerplant with turbochargers positioned between the cylinder banks develops maximum output of 300 kW/407 hp. The innovations in the new BMW 6-Series Coupe also extend to light technology, in the shape of Adaptive LED Headlights. Their bright white light provides an extremely intense and evenly spread illumination of the road. This technology is unparalleled in the segment and also allows the beam of the headlights to follow the progression of corners. The new BMW 6-Series Coupe heralds the arrival of an exceptionally sporty and exclusive 2+2-seater in the premium segment of top-class Coupes. The new model's extra length and width over its predecessor model combine with its 5-millimetre lower height to produce a strikingly low-set and powerful design. The new interpretation of the traditional BMW Coupe proportions is embellished by lines and surfaces inspired by the movement of waves. 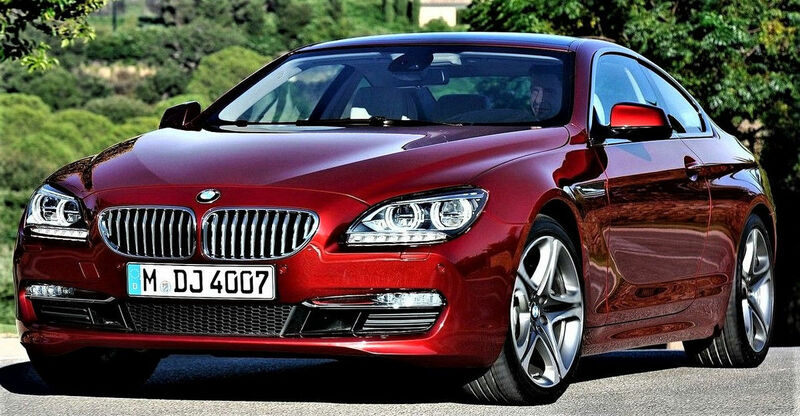 The new BMW 6-Series Coupe is equipped with bi-xenon headlights as standard. An accentuating trim element cuts across the top of the hallmark BMW twin round headlights to produce the intent look familiar from other BMW models. The optional Adaptive LED Headlights provide a fresh take on this established feature. The Adaptive LED Headlights for low beam and high beam contain LED light rings for the parking lights and daytime running lights, which are levelled off at the lower edge and overlapped at their top edge by an accent light - also featuring LEDs. The exterior design has been inspired by waves with clearly defined lines and volume formed around an object in flowing water. This gives the new BMW 6-Series Coupe a naturally powerful and sporty edge. The typical BMW swage line extends out from behind the front wheel arch, takes in the sporty gill feature and extends dynamically along the flank of the car to the rear. The exterior paintwork of the new BMW 6-Series Coupe can be ordered in a choice of eight metallic and two non-metallic shades, allowing customers to highlight both the sporting credentials of the Coupe and its modern and elegant character. The standard Dakota leather trim is available in three colour variants, the optional Exclusive Nappa leather in a choice of four shades. As an alternative to the standard Softskin surfacing, the instrument panel, door and side panels can be specified with Exclusive Nappa leather trim. All the seat variants available for the new BMW 6-Series Coupe come with crash-activated head restraints. The standard safety specification also includes front airbags, seat frame-mounted side airbags, side curtain head airbags for both rows of seats, three-point inertiareel seatbelts on all seats, belt force limiters and belt latch tensioners, as well as ISOFIX child seat attachments in the rear. In addition, the new BMW 6-Series Coupe is the first car in its class that can be ordered, as an option, with Integral Active Steering. This system combines the Active Steering system for the front axle - already available for the predecessor model - with a steering rear axle, allowing the steering angle and power assistance to be controlled at both the front and the rear with the help of electric motors. Precisely harmonised wheel deflections pave the way for extraordinary agility in dynamic driving situations. The new BMW 6-Series Coupe will be built alongside the new BMW 6-Series Convertible at BMW's Dingolfing plant. The BMW Group's largest production plant also produces the BMW 7-Series and BMW 5-Series.